Greek sphinx, sphinx, greek art, greek reproductions, greek gifts, greek, sphinxes, museum reproductions, greek statues, statues,greek sculptures. Metropolitan Museum of Art, New York. 540-530 B.C. This sphinx was a part of a Attic grave monument of the middle archaic period that reflected the opulence of the wealthy class of that time. The sphinx was placced atop a tall shaft, decorated with high relief sculpture and crowned by a cavetto capital. The shaft was supported by a rectangular base. All together the monument stands over 13 feet high. The sphinx is shown crouching instead of seated. 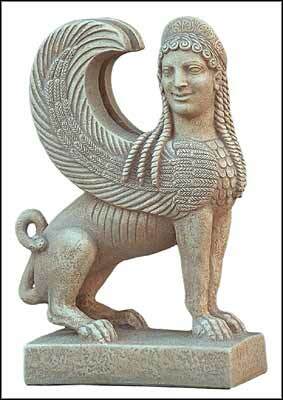 The greek sphinx had a woman's head, lion's body, serpent's tail and eagle's wind. In Greek myth the sphinx was sent by Hera to punish Thebes for displeasing the Goddess. The sphinx settled on Mount Phicium, near the city and asked everyone who passed by to answer a riddle she had learned from the three muses: "What being, with only one voice, has sometimes two feet, sometimes three, sometimes four and is weakest when it has the most?" Anyone unable to render the correct answer was immediately slain. One day Oedipus chanced along that road and guessed the answer: "Man, because he crawls on all four as an infant, stands firmly on his two feet in his youth and leans on a staff in his old age." Completely shattered by her defeat, the sphinx threw herself from the mountain and Oedipus was acclaimed king.